The Bureau of Labor Statistics reports that more than one million workers suffer back injuries each year. They can be very painful and can occur in the neck, mid or low back, affecting everything you do. Understanding how your spine moves and its limitations can help you prevent injuries and strengthen the muscles of your spine. Your spine is made up of 24 bones called vertebrae. These are divided into three groups: cervical, thoracic and lumbar or your neck, mid-back and low-back. In between each bone is a disc that acts as a cushion called the intervertebral disc. The bones are further connected by small muscles called multifidi that allow you to move your spine in conjunction with the larger muscles of your body. Spinal motion is measured in degrees of range of motion, or ROM. All movement starts from a neutral position, standing up straight, arms to your sides and eyes straight ahead. This is 0 degrees. The four movements measured are flexion, extension, lateral flexion and rotation. Flexion is forward bending; extension is bending backward; lateral flexion is side bending; and rotation is a twisting motion. Your cervical spine supports and enables you to move your head. It's made up of seven vertebrae and is shaped like an inward "C" called a lordotic curve. Flexion is dropping your chin to your chest, and the normal ROM is 45 degrees. Extension is dropping your head back and looking up. Normal extension ROM is 45 degrees. The normal ROM for lateral flexion, or dropping your ear to your shoulder, is also 45 degrees. Normal ROM for rotation is 80 degrees in each direction. 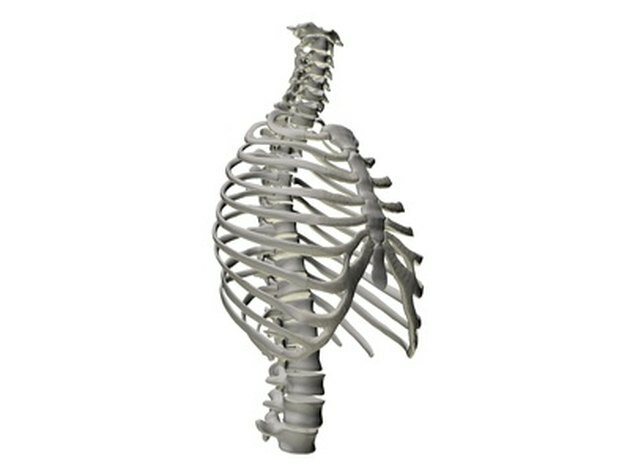 The thoracic section of your spine is made up of 12 vertebrae and shaped like a backward C, called a kyphotic curve. The lumbar spine is made up of five vertebrae, and it curves in like the cervical spine in a lordotic curve. Together, these vertebrae allow you to perform the major movements of the spine. The normal ROM for flexion or forward bending is 90 degrees. For extension, it's approximately 30 degrees. The normal ROM for side bending and rotation is also 30 degrees. Injuring your spine can happen at any time. Oklahoma State University reports the most common causes are heavy lifting, twisting at the waist while holding a heavy load, reaching and lifting, working in uncomfortable positions, standing or sitting in one position too long or a fall. You can control how much you lift and how you move, so take care when performing activities. To improve range of motion, stretch in each direction of natural movement. The American College of Sports Medicine recommends stretching two to three days per week to improve flexibility. Hold each stretch for 15 to 30 seconds. Perform stretches gently and not to the point of pain.